Provide comfort for the family of Ruth Albrecht with a meaningful gesture of sympathy. 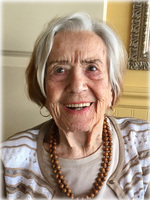 Peacefully passed away on January 7, 2019 at the age of 89. Beloved mother of Thomas (Ursula), Nicki (Sam), and the late Frank. Dear grandmother of Nicolas and Sebastian. Cherished sister of Evelyn, Susanne, and the late Ingrid. Celebration of Life will be held at Martin Luther Evangelical Lutheran Church, 2379 Lakeshore Blvd., Toronto, Ontario on Sunday, January 20. 2019. Visitation at 1:00 p.m. with service to follow at 2:00 p.m. In lieu of flowers, donations can be made to Martin Luther Church, The Kidney Foundation, and the Alzheimer Society. Donation envelopes will be available at the service. Online condolences may be left at www.hogle.ca. At bottom of this page you can click on Memorial Program to view full page tribute and poem by the family. Nicki, So sorry for your loss. Deepest Sympathy RE: Ruth Albrecht. Your smile was always heartfelt. We have been thinking back over the many years that we have known your mother, and of the friendship our mothers shared. Sadly we acknowledge the end of an era that this time brings. We are hopeful that your reflections of past memories will warm your hearts and bring comfort. Heartfelt condolences to all members of your family.